A class of drugs that eliminates or reduces pain. See local anaesthetic. The tip end of a root. A method of inducing apical closure, or the continual apical development of the root of an incompletely formed tooth, in which the pulp is no longer vital. A medical autoclave is a device that uses steam to sterilize equipment. A two-cuspid tooth found between the molar and the cuspid also known as an eye tooth or canine tooth. A process of removing tissue to determine the existence of pathology. Radiograph taken of the crowns of teeth to check for decay(caries). A process to chemically etch the tooth's enamel to better attach ( bond ) composite filling material, veneers, or plastic/acrylic. The breakdown and loss of the bone that supports the teeth, usually caused by infection or long-term occlusal ( chewing areas of the teeth ) stress. A fixed prosthetic replacement of one or more missing teeth, cemented or attached to the abutment teeth or implant abutments adjacent to the space. The involuntary clenching or grinding of the teeth. The hard deposit of mineralized plaque that forms on the crown and /or root of the tooth. Also referred to as tartar. The second tooth from the big front tooth, commonly called the eye tooth. The correct technical term for decay which is the progressive breaking down or dissolving of tooth structure, caused by the acid produced when bacteria digest sugars. A layman's term for decay. Also, the dental term for the hole that is left after the decay has been removed. A special type of glue used to hold a crown in its place. It also acts as an insulator to protect the tooth's nerve. The very thin, bonelike structure that covers the root of the tooth. The forceful holding together of the upper and lower teeth, which places stress on the ligaments that hold the teeth to the jawbone, and the lower jaw to the skull. The extensive dental restoration involving 6 or more units of crown and/or bridge in the same treatment plan. Using full crowns and/or fixed bridges which are cemented in place, that your dentist will rebuild natural teeth, fill in spaces where teeth are missing and establish conditions which allow each tooth to function in harmony with the occlusion ( bite ). A tooth-colored restoration(filling) made of plastic resin or porcelain. 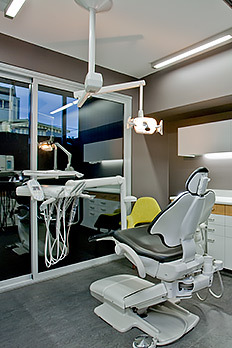 A diagnostic service provided by a dentist other than the treating dentist. A deep scaling of that portion of the tooth below the gum line. Purpose is to reduce bacterial load, remove calculus and infected gum tissue. The protruding portion(s) of a tooth's chewing surface. A thin, nylon string, waxed or unwaxed, that is inserted between the teeth & under the gums to remove food and plaque. A dental professional specializing in the prevention & treatment of gum diseases. She/He acts as the patient's guide in establishing a proper oral hygiene program, along with removing plaque and/or calculus from the crown & roots of teeth. The part of the tooth that is under both the enamel which covers the crown and the cementum which covers the root. A removable appliance used to replace teeth. A complete denture replaces all of the upper teeth and/or all the lower teeth. Farther from any part of reference. The procedure in which the exposed pulp is covered with a dressing or cement that protects the pulp and promotes healing and repair. A localized inflammation of the tooth socket following an extraction due to infection of a blood clot. The hard, calcified (mineralized) portion of the tooth which covers the crown. Enamel is the hardest substance in the body. The dental specialty that deals with injuries to or diseases of the pulp, or nerve, of the tooth. A dentist who deals with the cause, prevention, diagnosis, and treatment or injuries and diseases that affect the dental pulp , tooth root, and periapical tissue. Pertaining to the outside of the mouth. Pertaining to or toward the face ( Buccal, Labial ). Material used to fill cavity or replace part of a tooth. Often referred to as a restoration. A chemical compound used to prevent dental decay, utilized in fluoridated water systems and/or applied directly to the teeth. Muscle fibres covered by a mucus membrane that attaches the check, lips and or tongue to associated dental mucous membrane. The removal of a frenum. The soft tissue that covers the jawbone, also referred to as the gums. A surgical removal of the gingiva (gum tissue). An inflammation or infection of the gingiva; the initial stage of gum disease. An unerupted or partially erupted tooth that is positioned against another tooth, bone or soft tissue so that total eruption is unlikely. An artificial device, usually make of a metal alloy or ceramic material, that is implanted within the jawbone as a means to attach an artificial crown, denture , or bridge. A cast gold filling that is used to replace part of the tooth. The injection given in the mouth to numb the areas where a tooth or area needs a dental procedure. Often referred to as Lignocaine. Toward or situated in the middle. The broad, multicusped back teeth, used for grinding food, they are considered the largest teeth in the mouth. In adults there are a total of twelve molars (including the four wisdom teeth, or third molars), three on each side of the upper and lower jaws. A controlled mixture of nitrogen and oxygen gases (N2O) that is inhaled by the patient in order to decrease sensitivity to pain. Also referred to as laughing gas. An intraoral x-ray taken with the film held between the teeth in biting position. A cast gold or porcelain filling that covers one or all of the tooth's cusps. A condition in which the upper teeth excessively overlap the lower teeth when the jaw is closed. A condition in which the upper teeth excessively protrude the lower teeth when the jaw is closed. A removable appliance used to replace one or more lost teeth. The specialized branch of dentistry that deals solely with treating children's dental disease. The area that surrounds the tip of a tooth's root. An inflammation of the gum tissue around the crown of a tooth, usually the third molar. Relating to the tissue and bone that supports the tooth (from peri, meaning "around", and dont meaning "tooth"). The inflammation and infection of the gums, ligaments, bone, and other tissues surrounding the teeth. Gingivitis and periodontitis are the two main forms of periodontal disease. The area of dentistry concerned with the diagnosis, prevention and treatment of periodontal disease. The area which surrounds a portion of the root of the tooth. The thirty-two adult teeth that replace the baby, or primary teeth. Also known as secondary teeth. Education and treatment devoted to and concerned with preventing the development of dental diseases. Any action taken by the patient, assisted by the Dentist or Hygienist, that serves to prevent dental or other disease. Sealants, cleanings and space maintainers are examples of preventative treatment. The first set of teeth that humans get, lasting until the permanent teeth come in. Also referred to as baby or deciduous teeth. Any device or appliance replacing one or more missing teeth. The hollow chamber inside the crown of the tooth that contains its nerves and blood vessels. The removal of a portion of the tooth's pulp. A condition characterized by the abnormal loss of gum tissue due to infection or bone loss. The process of resurfacing the tissue side of a denture with a base material. The part of the tooth below the crown , normally encased in the jawbone. It is made up of dentine, includes the root canal, and is covered by cementum. The hollow part of the tooth's root. It runs from the tip of the root into the pulp. The process of treating disease or inflammation of the pulp or root canal. This involves removing the pulp and root's nerve(s) and filling the canal(s) with an appropriate material to permanently seal it. The hole in the jawbone into which the tooth fits. A dental appliance that fills the space of a lost tooth or teeth and prevents the other teeth from moving into the space. Used especially in orthodontic treatment. The removal of calculus and plaque found on the tooth below the gum line. The removal of calculus and plaque found on the tooth above the gum line. The connecting hinge mechanism between the lower jaw and the base of the skull. The last of the three molar teeth, also called wisdom teeth. There are four third molars, two in the lower jaw two in the upper jaw, on each side. A list of work that the dentist proposes to perform on a dental patient based on the results of the radiographs, examination and diagnosis. Often more than one treatment plan is presented. An artificial restorative material, usually plastic, composite, or porcelain, that is used to provide an aesthetic covering over the visible surface of a tooth. Most often used on front teeth.